Hair straightening can be achieved by a variety of methods. Some of these techniques can be executed safely at home, but the longest-lasting straightening measures are conducted in salons by qualified professionals. When you are exploring straightening options there are several factors to consider in order to achieve the best results while minimizing any styling damage to your hair. Hair straightening can occur by a chemical process, an at-home or salon heat styling technique, or a keratin treatment. Hair that has already incurred cuticle damage from coloring or repeated heat styling will do poorly with chemical relaxers and flat irons. Since certain straightening techniques can cause more damage to hair, it is important to assess with a stylist just how much more your hair can take. In-home straightening techniques are always less expensive than those carried out by a salon professional. You will need to weight the costs of heat styling equipment, such as quality flat irons and heat protectant products, against the expense of more long-lasting straightening methods. No hair straightening method is truly permanent, as your hair will eventually grow and the incoming hair will also need to be treated. Chemical relaxers can permanently straighten the hair that is growing, though there are noticeable drawbacks to this procedure. Keratin protein treatments will last for as long as five months depending on lifestyle practices. Flat irons produce results that disappear after your hair's next washing. How devoted you are to the straight hair look will greatly influence the technique you choose for the process. Flat irons are heat styling utensils that heat the hair and smooth the cuticle between metal or ceramic plates. Flat irons were once predominantly metal, but ceramic and infra-red technology is becoming more common in the world of heat styling. 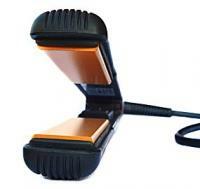 Ceramic flat irons distribute heat more evenly and cause less damage to the hair shaft. Flat iron results do depend on high levels of heat, though many of these irons will offer multiple heat settings. The disadvantage of such methods is that heat styling will cause gradual damage to the hair cuticle. Products such as heat protectant sprays and silicone serums may help to mitigate this damage and promote shine, but even the best quality flat iron will remain a threat to overall hair health. 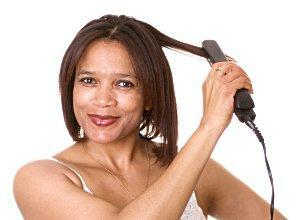 For individuals who desire long-lasting and daily straightening results, a flat iron is probably not the best route. However, this method is excellent for special events or just the occasional straight day. You can purchase flat irons at drugstores, beauty supply stores, and Sephora retailers. Hair relaxers use a chemical to alter the hair's natural texture and produce a permanently straight result. In the same way chemicals can be used to curl the hair for a perm, they can also be employed for a long lasting straight result. The disadvantage of relaxing methods is that such chemicals are often skin irritants and have been implicated in a horde of hair woes from splitting, breaking, scalp damage and even hair loss. More information regarding the precise chemicals used in popular relaxing formulas is available at Skin Biology. However, despite the potential negative results from long term use, hair relaxers are by far the most permanent method for straightening unruly hair. Keratin straightening systems are amongst the most nutritive styling techniques for the hair. This method involves coating the hair with keratin protein which is then sealed using a high heat flat iron. Though keratin coats the hair with an essential protein that can help to improve texture and manageability, this process is still not entirely safe. FoxNews.com ran a report in March of 2011 outlining the potential hazards of the popular Brazilian Blowout trend. Formaldehyde is often included within many of these keratin products, though the highest quality treatments will not contain such toxins. Keratin treatments are best conducted by a professional, due to the intense 450 degree heat that is applied during the sealing process. However, these products can also be purchased and used at home. Results can last anywhere from 4 weeks to 5 months depending on how often you wash and style your hair. Both of these agencies recommend the highest quality salons and products that remain at the forefront of keratin hair technology. The price of beauty is often high, with a single keratin treatment running in the mid-hundreds and even a high quality flat iron costing about a cool hundred. Whether you relax, flat iron, or keratin your hair into a smooth texture, it is the maintenance that will accrue the most cost. Those who choose to heat style their hair repeatedly will typically need an arsenal of deep conditioning treatments, protectant sprays, and styling aids. Some styling methods are less expensive than others in the short term, but the cuticle damage that may ensue can often lead to a dependency on other hair products in order to mitigate the inevitable effects. Cost and maintenance factors should always be at the forefront of any decision that involves the health of your hair.